I can feel the herd getting restless. In fact, people have spent so long waiting for me to address the fungus monster in the room that they took it upon themselves to make a reddit post and tried to do it themselves. Things went… OK.
Magnified 20x, a grocer’s apostrophe looks relatively harmless, but in a sentence it can cause acute migraines in 5% of the population, myself included. ‘Superfluou’s apo’strophe’s a’side, this was a pretty good reddit post and probably should have gotten a good discussion going. It didn’t. Would it have? Or do we have years and years’ worth of data that says otherwise? Have they? 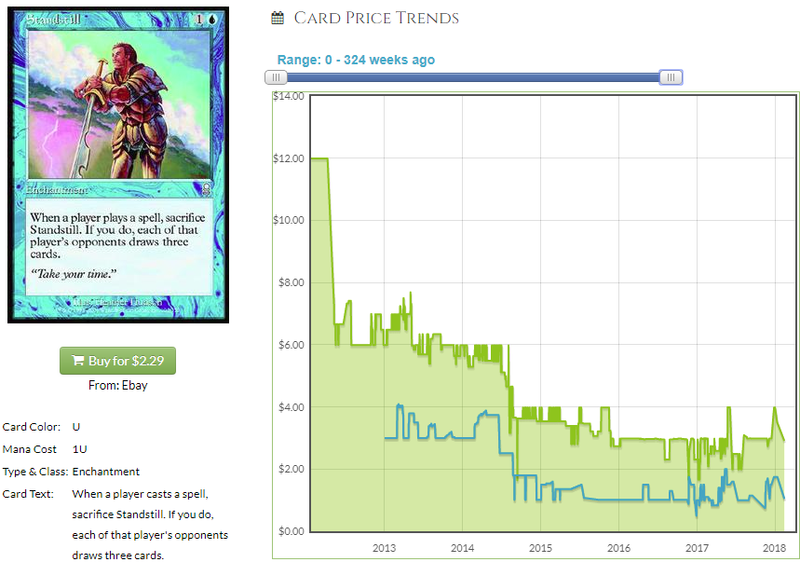 Or did they just get lucky that Commander 2017 was tribal so they could run out and buy cards like Waiting in the Weeds and then pat each other on the back as they tried to sell them to each other? Also, buyout is a noun. I feel like eyebrows Goofus is onto something, here. 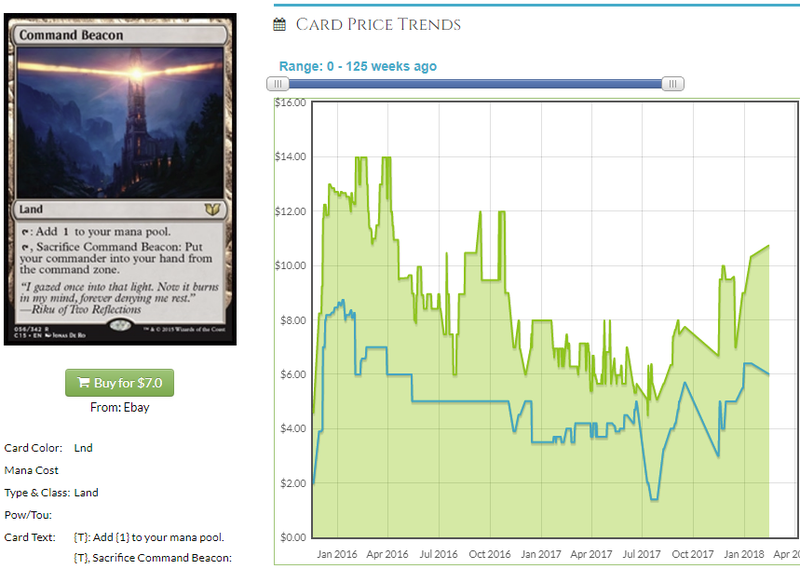 I don’t agree that the sheer number of new commanders will keep anything from spiking, but I do think that the card everyone wants to talk about may suffer from affecting too many cards that could go in the deck. 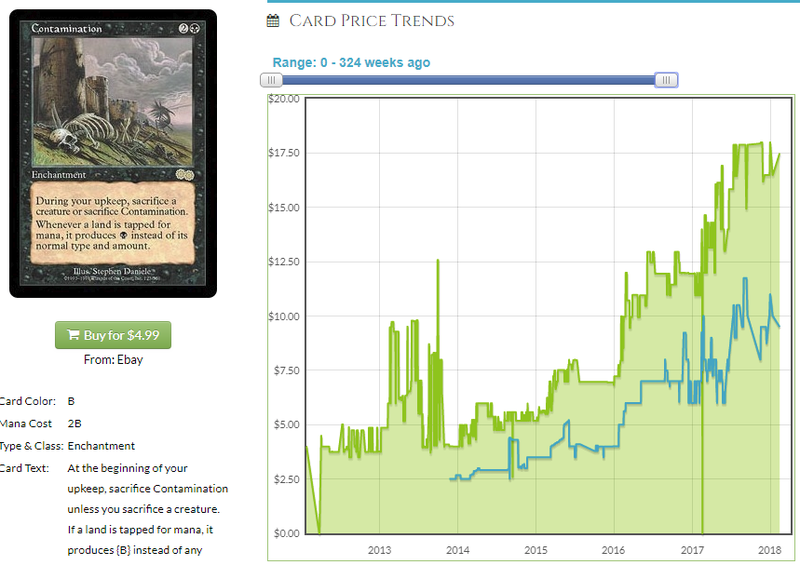 If Muldrotha is basically less popular than Atraxa, there’s a chance nothing goes up at all. When there are too many boats and not enough tide, something about the boats don’t go up? Look, I’ve been trying for awhile to pretend the boat metaphor was an actual sinking boat and abandon it. I think we should look at the sheer volume of cards that could go up based on Muldrotha decks being a thing, which I think they will. We can evaluate whether or not any of them have a chance of going up or if there are just too many ways to build the deck. Let’s begin. 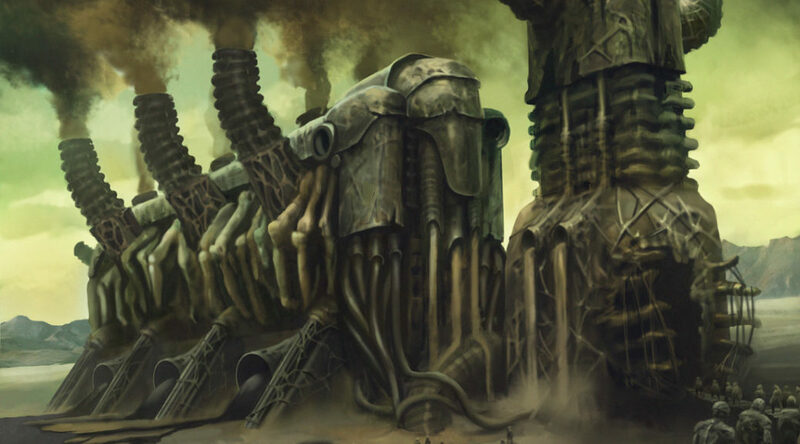 I think we should look at Muldrotha before we continue. You cut down on the number of RTFC errors you commit as a writer by R’ing the F’ing C.
I can’t F’ing R this F’ing C. Let’s enlist the help of some type. The first class of cards I want to look at are the really annoying enchantments. What if, instead of building a board, we just spammed the same one back out every turn, ruining everyone’s lives? Cards in this class – Hesitation, Standstill, Mystic Remora, Decree of Silence, Lunar Force. 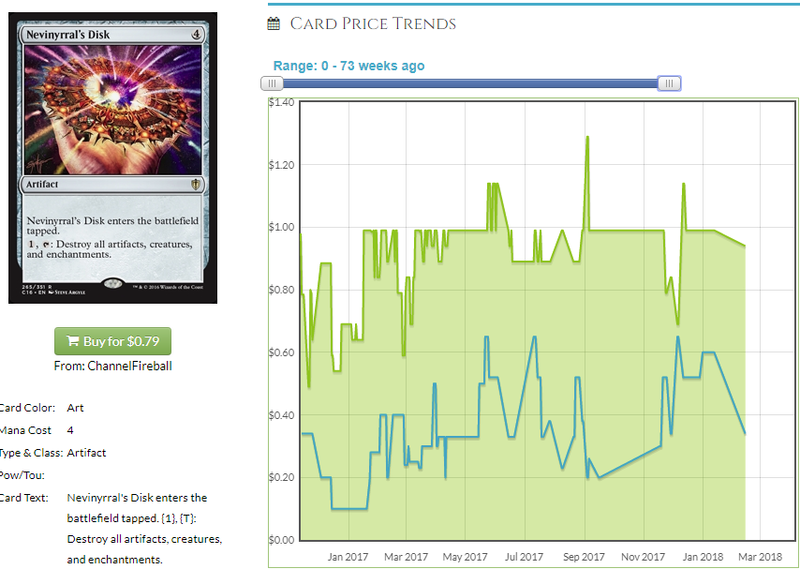 Standstill is at a historic low and while that means it could have upside, it also means Muldrotha is on its own. It would have to pull a lot of weight considering Legacy isn’t really doing Standstill any favors right now and it’s not really an EDH card at the current moment. Pass. 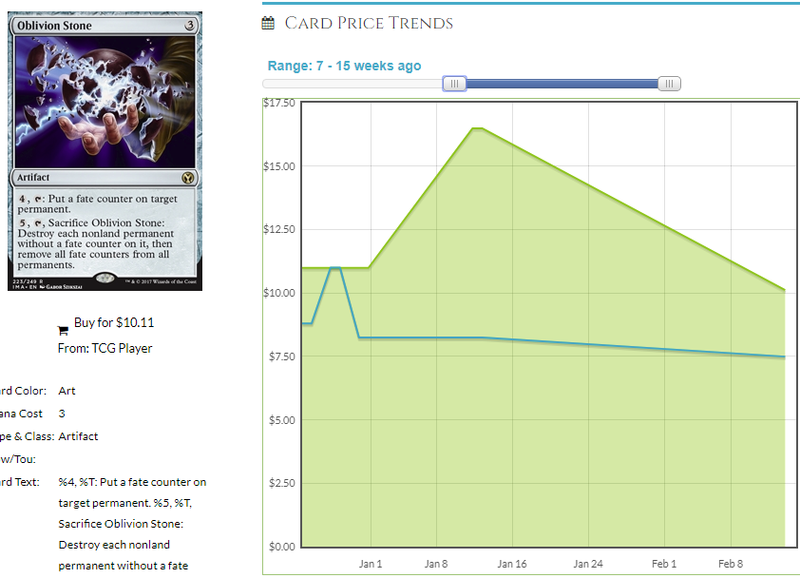 Spikes caused by the previewing of a card are like clockwork. The card goes from x to 8x then falls to 4x barring actual adoption. You don’t really ever eat it if you buy at x but those who buy at 4x hoping to get out at 8x tend to eat it. Don’t hope to sell to greater fools, just get out when you can. 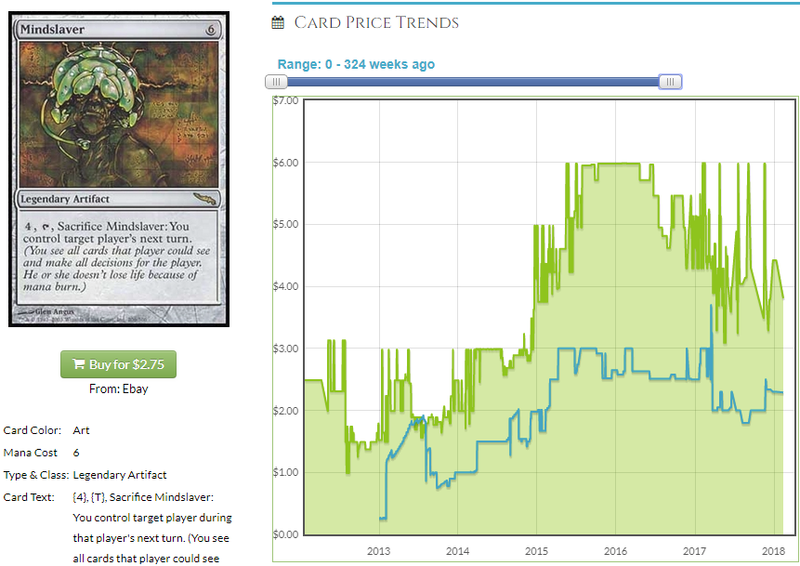 The only thing this card has going for it is that everyone ferreted out the cheap copies to avoid paying $7 so if this goes up again, there are no cheap copies squirreled (the opposite of ferreted) away and the only source of copies is the cold, merciless open market. Hesitation is and will likely stay a dime. Mystic Remora is already good and this won’t likely change much. We’re off to a rough start because while these strategies are annoying, I don’t think they or any other strategy will be universal and they probably need to be. 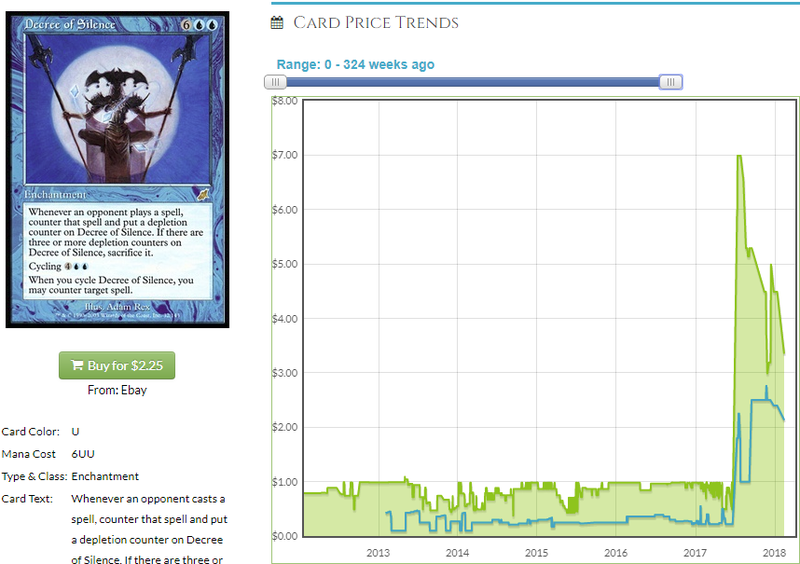 Muldrotha sure isn’t going to make this card cheaper, is it? While this isn’t on the Reserved List, it’s not likely on anyone’s “this needs a printing” list, either. It’s so absurdly anti-social that only the spikiest of decks will consider running it, ruling it out of Commander precons. Usually this card is mitigated by the upkeep cost, but you can let this die and just bring it right back. Gross. Cards in this class- Nevinyrral’s Disk, Pernicious Deed, Oblivion Stone. Nev’s Disk has been printed tooooo many times. Deed isn’t looking too bad. 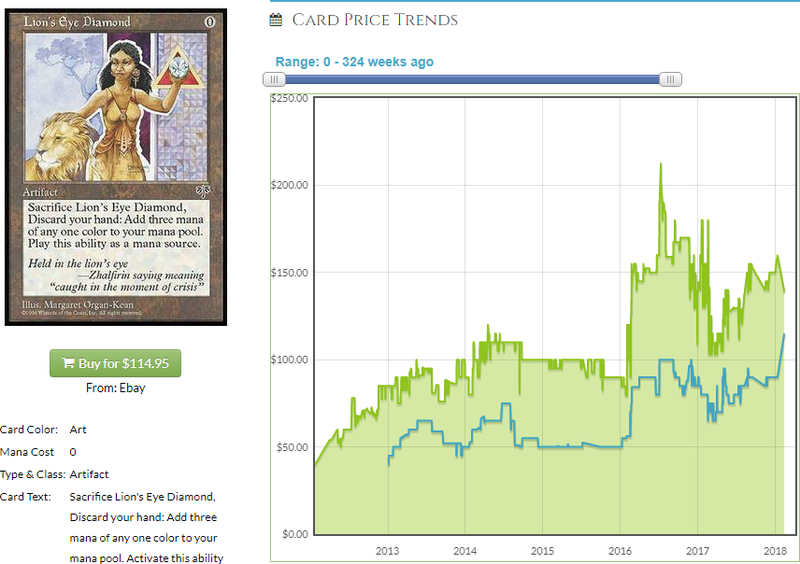 It has decent ‘REC metrics and adoption in more than just EDH. I expected to poop on almost every pick, but this doesn’t seem too bad. It’s at its floor as are a lot of Conspiracy 2 cards and is beginning to recover. 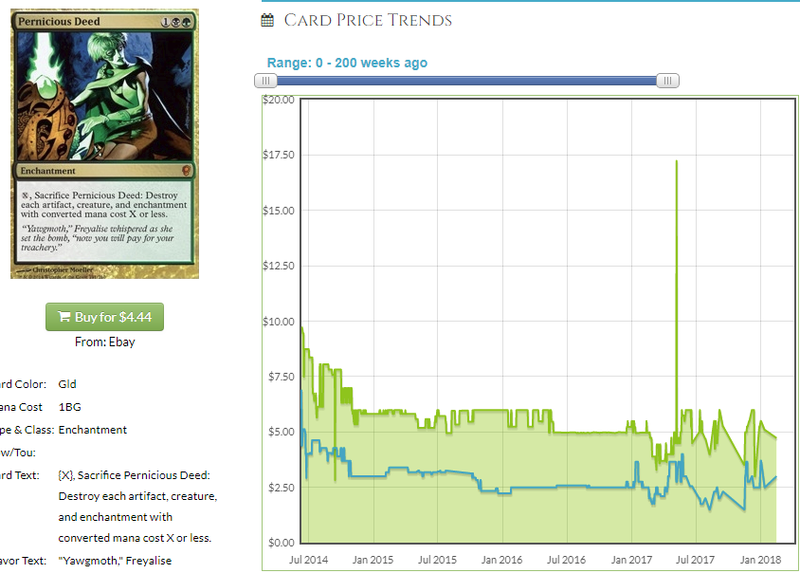 I think this is the time to get in on deed regardless and its utility in Muldrotha could be a good a time as any to make some bucks on a solid card. I didn’t expect to like this as much as I do, but Deed is probably solid right now. 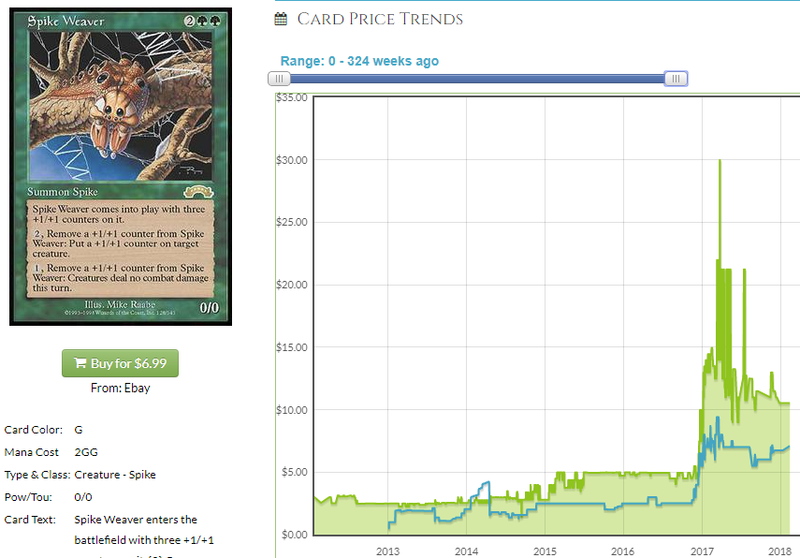 This is no pricing error, you can actually snag a foil Iconic Masters O Stone for the same price as a Mirrodin one. I think that’s bound to look pretty silly in 6 months. I can’t imagine eating it because you bought foil copies but I guess nothing is impossible. People are done drafting Iconic Masters which means new copies enter the market at the speed of people popping $12 booster packs. It seems like we’re basically at peak supply and we have a glut of these foils I don’t mind swooping in on. Finally, I want to talk about cards that are just really good with Muldrotha and how there aren’t too many cards in this camp for Muldrotha to push up since I expect them to be in 70%+ of all Muldrotha decks if people are smart. This is not on the Reserved List but it probably should be. This is also going to be in every Muldrotha list ever if people are smart. This is busted as heck and at least one of your opponents is bound to have the requisite number of creatures. Play Forbidden Orchard if they refuse to play along. This is just too good in Muldrotha decks and outside of them, too, I guess. This is a rare from Urza’s Legacy and while it’s not on the Reserved List, it’s not on anyone’s “reprint this ASAP” list, either – not in a world where Phyrexian Altar is still unreprinted. I’m betting that Commander 2018 is Planeswalkers. That being the case, the earliest this gets reprinted in a Commander precon is Commander 2019. For those keeping score at home, that’s like 18 months from now. You think you can make some money buying in at $10 and sitting on them for 18 months? I do. This managed to avoid ending up on the Reserved List because it’s not quite as good as Exalted Dragon, you see. 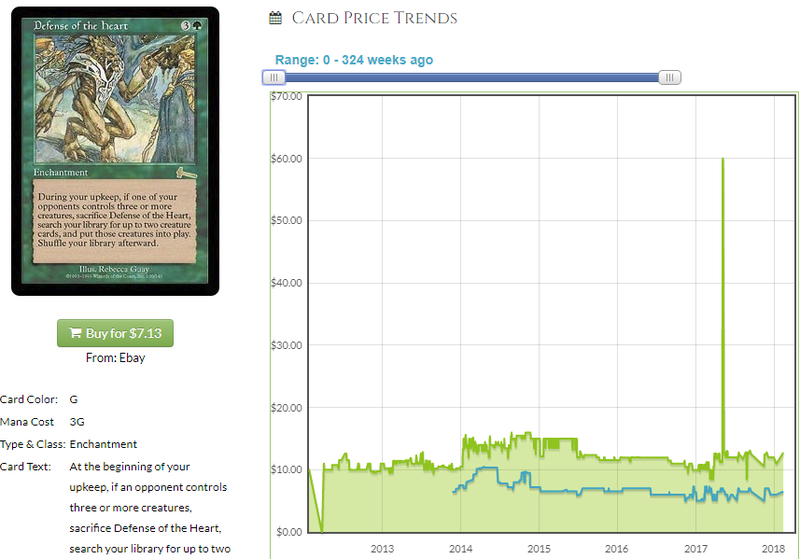 That said, it’s been expensive for a while and it doesn’t seem like there is a convenient place to reprint it. Its combo potential is very high making it a tricky EDH deck inclusion and it’s very set-specific making it tricky to print elsewhere. This is also pretty damn good with Muldrotha since you can fog over multiple turns then replay him full of counters and ready to rumble. 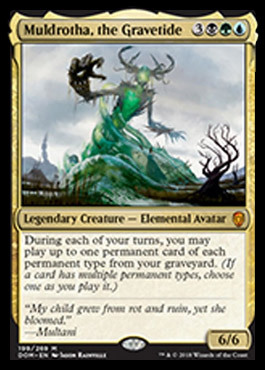 I think we will have time between EDHREC filling up with Muldrotha lists and prices actually moving and I plan to revisit the commanders I covered to see if there is anything I missed, but I think you should take a stab at Muldrotha. In my limited dicking around with it, I found the following cards do a lot of work. Caustic Caterpillar, Vessel of Nascency, Seal of Doom, Seal of Removal, Seal of Primordium, Fleshbag Marauder, Sidisi, Undead Vizier (another reason to look at this card – I think you go deep on Sidisi nowish). Other people are beginning to post lists, so see what they’re on and we’ll revisit when we see stuff posted on the ‘REC. Thanks for reading, nerds. Next week we’ll wade into the giant pile of potential commanders and look at more opportunities. Until next time!